If you transfer to one of Maine’s public universities before completing your associate degree or certificate at a Maine community college, you may be able to transfer credits earned at the university back to your community college to satisfy associate degree or certificate requirements. The Maine Community College System and the University of Maine System have established a reverse transfer agreement that makes it possible for students to earn an associate degree or certificate by combining credits from their university with credits previously earned from their community college. Want to learn more? For consideration of being awarded an associate degree or certificate, university students need to complete a Reverse Transfer Participation and Transcript Request Form. You can contact your community college to inquire about your degree audit and progress toward your degree certificate. 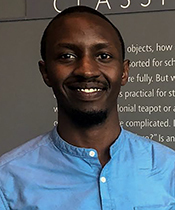 Born and raised in Rwanda, Yves Nzigye, graduated from Portland High School, where he learned about SMCC and its Embark early college program. It provided the support and advising he needed to begin his college career. He took all of his general education courses and transferred to the University of Maine to study engineering. He was able to take advantage of SMCC’s reverse transfer program and earn both his associate degree in liberal studies from SMCC and his bachelor’s degree in civil engineering from UMaine. He now works as a transit and rail engineer at VHB, an engineering firm in Boston.